If you’re new to Windows 10 and experience an issue where the time and date isn’t correct on your computer, here’s a quick look at how to fix it. After installing the April Cumulative Update KB3147458 Build 10586.218 yesterday, the time on my PC was off by an hour. For some reason, my time zone was switched from Central to Eastern. If you’re new to Windows 10 and experience a similar issue where the time isn’t correct on your computer, here’s a quick look at how to fix it. 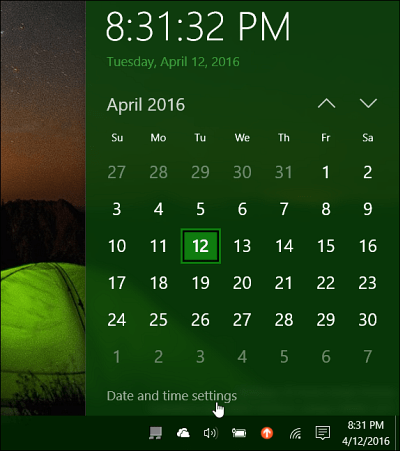 Click the clock on the taskbar and then select Date & Time settings under the calendar that pops up. Then turn off the options to set the time and time zone automatically. 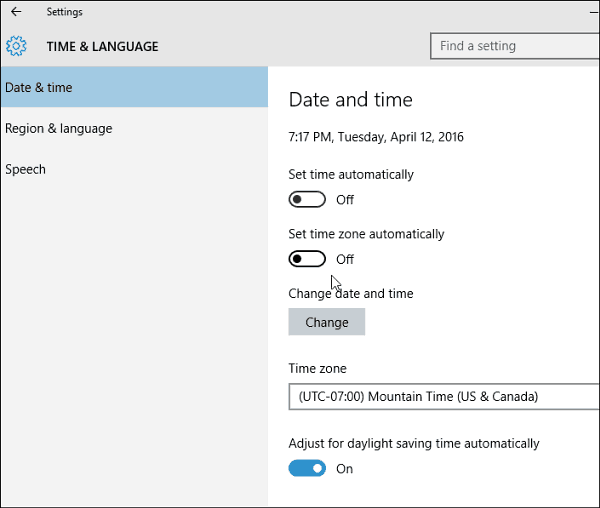 If these are enabled, the option to change the date, time, and time zone will be grayed out. After that, select the correct time zone from the dropdown menu. Then to change the time and date, click the Change button and in the screen that comes up, you can set it to what you want. Remember to click the “Change” button to make sure that it’s saved. After you have everything set to what you want, go back and turn on the option to set the time and zone automatically if you want. 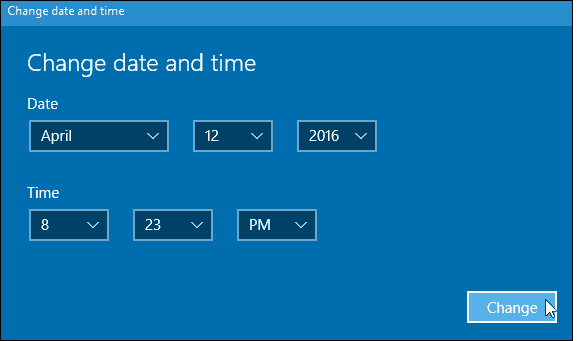 For more on managing the time and date on Windows 10, check out our other tips listed below. Hello Brian love your posts which are very informative…….. Both “Set Time Automatically” and “Change date and time” buttons are greyed out. Can’t seem to be able to change the date and time in Windows 10. After I did a system restore on my computer I noticed that the time had gone back to pre-“savings time”. Went to so many different sites and couldn’t get anything to work so that I could change the time on my Windows 10. This information was so simple and easily presented and worked perfectly. Some of us like it simple like ourselves! Thanks so much!! !